Lily is not quite a typical woman in Toledo, Ohio, 1896. She may be repressed and dependent on her husband, but she supports the vote for women and has a mind of her own. When Johnny Pentland is found dead at a notorious brothel, she discovers her husband is not the man she thought he was. 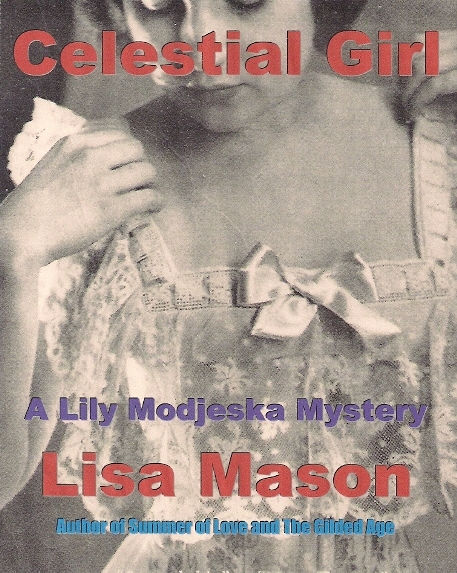 Celestial Girl, A Lily Modjeska Mystery is on Nook, US Kindle, Canada Kindle, UK Kindle, Smashwords, Apple, and Kobo. Celestial Girl, A Lily Modjeska Mystery is on Kindle in Australia, France, Germany, Italy, Spain, Brazil, Japan, India, Mexico, and Netherlands. Celestial Girl, the Omnibus Edition includes Books 1 through 4 of the Lily Modjeska miniseries. In Book 1: The Heartland, Lily flees Toledo on the Overland train. She must share a seat with Jackson Tremaine and befriends the Celestial Girl, the daughter of a Chinese dignitary. But appearances are not what they seem. In Book 2: Jewel of the Golden West, Lily and Jackson arrive in San Francisco and discover the murder of an immigration official connected with the Celestial Girl. They are compelled into a dangerous murder investigation. As they begin a passionate affair, a gangland contract for murder is taken out on Lily’s life. In Book 3: The Celestial Kingdom, Lily and Jackson journey to Imperial China, confronting soldiers of the Boxer Rebellion and brutal slavers. Their relationship is challenged along the way. Risking her life, Lily discovers secrets vital to the identity of the Celestial Girl. And in Book 4: Terminus, Lily and Jackson return to San Francisco and solve the tragic mystery of the Celestial Girl.